Spring Babies and a New Hobby! Can you see those little beaks peeking up? So sweet! I think I mentioned that I went to a local guild's quilt show a few weeks ago and fell in love with some hand appliqued quilts. I've admired Kathleen Baden's work before but this put me over the edge so when she offered me a class at a local shop, I jumped. This is the project she had me start with and so far Im in love with the process. It's entirely done by hand so I'm pretty proud of myself. 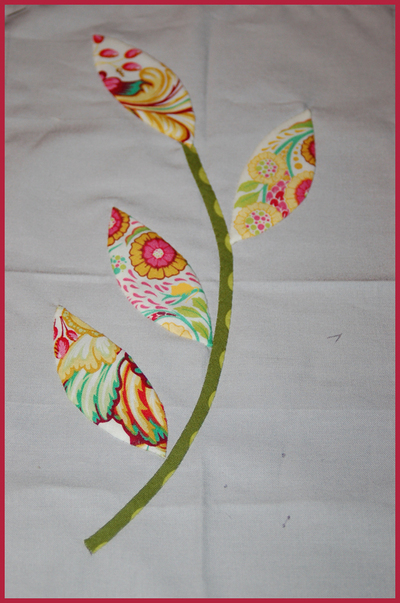 I need another leaf and then three berries before I'm finished with the applique part! What do you think? Does anyone out there do applique. I'm looking for a pattern to start after this! Your sewing is really taking off! I adore the use of colours and hope to try one someday soon. Unfortunately, life's been so busy that I haven't had time to pick up my appliqué since I returned from holidays. Your blog's been making me want to do all the things! 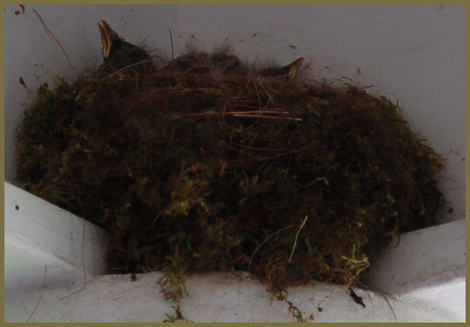 Are the babies baby robins? Beautiful, Paige! And very neat work! Gorgeous! Can't wait to see where you go with it. I've never tried appliqué, but it's on my list. This page contains a single entry from the blog posted on April 29, 2012 8:34 PM. The previous post in this blog was Winner, WInner, Chicken Dinner!.